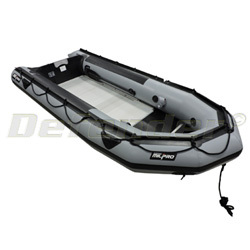 A veteran of Zodiac's Military and Professional range of craft, the Grand Raid series has been one of the most respected inflatable Boats used world wide. Recently, the series has gone through another evolution, further enhancing its platform. Suitable for a wide range of applications, it is easy to see why the Grand Raid has been around for generations. The features of this boat include a blunt bow, which increases the usable space of the Boat, and I/C (Inter-communicating) valves, which keep the inflation process simple. The Grand Raid Series Boats are designed to be functional, durable and versatile. Two people can assemble the Grand Raid and have the craft operational in less than 20 minutes. Boat Length: 13' 5" to 14' 4", Max. Beam Width: 74"